Former Rep. Beto O'Rourke (D., Texas) opposes the White House's desired southern border wall, but he deferred to the "wisdom of the people" on a range of other immigration questions in a new interview. "That’s a problem when you’re like, ‘It will be a wall,’ or ‘It will be this,’ or ‘We can only do it with this,’" O’Rourke said when asked why he doesn’t have firm stances. "The genius is we can nonviolently resolve our differences, though I won’t get to my version of perfect or I, working with you, will get to something better than what we have today . . . It’s rare that someone’s ever been able to impose their will unilaterally in this country. We don’t want that." In O'Rourke's six years in the House—he didn't run for reelection due to his unsuccessful Senate bid against Sen. Ted Cruz (R., Texas)–he played a "negligible role in shaping immigration policy" and even now "rarely uses his expanding national platform" to call for specific legislation or immigration system changes, the Post reported. After losing his race against Cruz last year while winning progressive admiration around the country, he says he believes the people will do the "right thing," although he wouldn't say what that was. "I trust the wisdom of people," he said. "And I’m confident—especially after having traveled Texas for two years—people are good, fundamentally, and if given the choice to do the right thing, they will. To do the good thing, they will." He said during the Senate campaign he wouldn't run for president, but he changed his mind in November and said he is not ruling it out. 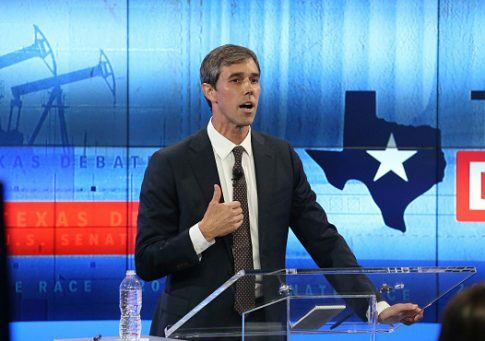 O'Rourke has sought to counter President Donald Trump's dark rhetoric about the border by streaming videos of himself walking through El Paso or at outposts like McAllen, Texas, to try to convey the areas are peaceful and safe. He became known during his Senate campaign for his frequent social media postings and viral video clips, and he's continued in the months since the race, even live-streaming a trip to the dentist. He supports boilerplate Democratic positions on illegal immigration such as supporting a pathway to citizenship and closing private immigration prisons, the Post reported. O'Rourke also couldn't say whether he agreed with Trump's decision to withdraw troops from Syria, stating, "I don’t necessarily understand, and I’ve been a member of Congress for six years." He called the proposed "Green New Deal" by Democrats in the new Congress to drastically overhaul the nation's energy system in order to combat climate change "a perfect point from which to start a conversation." This entry was posted in Issues and tagged Beto O'Rourke, Donald Trump, Illegal Immigration, Syria. Bookmark the permalink.